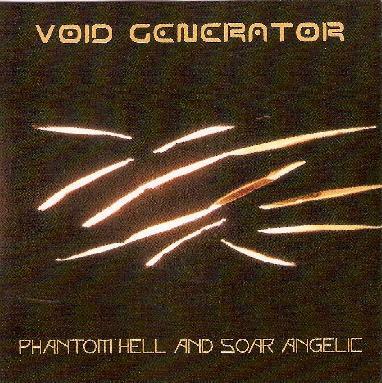 Void Generator - "Phantom Hell and Solar Angelic"
Spaghetti spacers Void Generator deliver a sound markedly different than the operatic prog rock most have come to expect from anything Italian. Texturally similar to Pink Floyd, Void Generator creates sweeping, monolithic blocks of sound that alternately drift, soar, and explode on waves of steely guitar and shifting electronics. Three long tracks make up Phantom Hell and Soar Angelic, each achieving its own dynamic space. Message from the Galactic Federation starts out as a fairly conventional stoner rock anthem but progresses through several instrumental breaks that feature molten guitar riffing over a crashing rhythm section. This piece has an uncharacteristic Seattle sound to it at times (perhaps because of the lead singer's slurred vocal delivery) but otherwise falls squarely into the mold of Monster Magnet-styled stoner/space rock. The Morning shifts down-tempo into an almost Doors-like evocation of drug-induced euphoria. The song's repeated main motif seems somewhat too insistent, however, and as a consequence the piece never really seems to "go" anywhere. The album's best track Ethernaut returns the listener to the grinding thud of stoner rock hell, with several ethereal interludes mixed in between the forward thrust of the heavier sections. As with the opening track, Ethernaut seems to be a lineal descendant of Pink Floyd's Echoes and Zeppelin's No Quarter, though with enough distance between them to ensure that Void Generator aren't merely copyists or mimes. The Italian band Void Generator are back with their third release and this is something quite different as the band head into very long tracks. The CD has 4 songs in 76 minutes, even though only 3 are listed on the CD. The CD starts off with quite a riff workout and is called Message from the Galactic Federation which is 15 minutes long. The band is a five piece with a person on synth and another on Accumulator but they are not contributing that much to the sound most of the time. This track is a complex three man rock riff workout that builds and comes down and rises again to return to the same cool riff. There are some electronics and synths mostly at the end where they repeat the riff over and over for several minutes in a very stoned fashion. Cool track. The Morning is next and takes us out there for 13 minutes. It starts slowly and a bit spacey. A melodic vocal slowly appears as well as the track builds. It reminds me a bit of Motorpsycho. Not sure why though. It is not until 5½ minutes that the band pick up the slow pace and the track develops. I think they took a bit too long in the first 5 minutes. They could have added some cool synths or sound effects to spice it up, but perhaps they will do this live. The track is building up like a Colour Haze track by 8 minutes. There is some very nice spacey guitar and synths at the end. The Eternaut is next and goes on for 18 minutes. It starts with a slow bass line and the guitar player takes his time to make his appearance but the huge stoner riff kicks in around 2 minutes and off we go. The middle section has a very strange but cool spaced out jazz-like guitar solo with some nice effects pedals being used. After the guitar solo a heavy section with spaced out organ and synth effects takes you to another planet. An amazing track. But even though the tracks listed are finished there is a 23 minute bonus jam that is totally amazing with some killer guitar work. This is just a fantastic CD.